Normally, you’d want to keep water and steel away from each other. This is not a normal class. CorTen steel is specially forged to rust only on the outside, forming a beautiful patina that will last for years of use in even the wettest environments. What better way to use it than in a fountain! Class Details: Six week class covering the principles of fountain design, construction, basic metallurgy of CorTen alloys, and how to cut, weld, and form this amazing material. 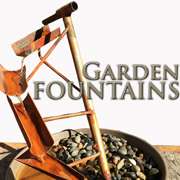 The first two sessions will involve assembly of a simple, pre-cut fountain kit, and the next four will be a guided build of your very own water feature (we’ve designed three different styles to get you going). If you have a design in mind other than one of the three main types we’ll offer, you can discuss it with the instructor, and may be able to build something truly unique. Instruction fee is $210, Consumables and shop fee is $195 (Total: $405) SPECIAL FIRST RUN PRICE $375 Class price includes steel and a pump for your project under 2′ (but if you want to make a garden geyser go ahead). Six student max. Note about wait lists.